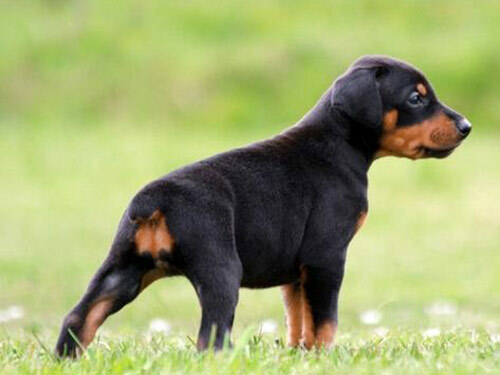 The Doberman Pinscher is a very bright dog and a very loyal and brave guardian. It is constantly on alert in an effort to protect its family or its home and territory. As a companion, the Doberman Pinscher is very adventurous and loves to explore its surroundings. It loves a good challenge. The breed is very obedient and responsive to training. It is also very sensitive and pays very close attention to its surroundings. It can occasionally become domineering at times. When approached by a stranger it can be reserved and shy, but if it feels intimidated, it may become aggressive. It also becomes aggressive if approached by strange dogs. This breed needs daily exercise. If it is not properly mentally stimulated on a daily basis, or exert physical energy, it will most likely become destructive due to frustration. Exercise requirements can typically be met by a long walk on a leash, or a strenuous workout in a gated area. Because the dog is adventurous, it is important to keep an eye on it when exercising so it does not stray. It can survive in moderate climates but really thrives if it is living in a human home with its family. Its coat care is very minimal, as its fur is very short. There are a few minor concerns regarding the health of the Doberman Pinscher including vWD, demodicosis, osteosarcoma, gastric torsion, and Chronic Hip Dysplasia. There is also a string of albinism in this breed that is occasionally seen. Other occasionally seen conditions include hypothyroidism, PRA, and narcolepsy. There are no real major concerns that surround this breed. However, it is important to take good care of your pet and get the suggested tests. The suggested tests for Dobermans include cardiac tests, hip and eye tests, and DNA tests. If kept healthy, your Dobermans will live from 10 to 12 years of age. Louis Doberman of Thuringen is one of the very few people who has ever had such a huge impact on the canine world. He was a tax collector who typically went to homes door-to-door and felt as though he needed a guard dog to protect him on his daily rounds. He crossbred a German Shepherd and German Pincher initially, later crossing his breed with the Greyhound, and the Black and Tan Manchester Terrier. Eventually, he created a breed that is known as the Doberman Pincher today, consequently named after him. Originally, Dobermans were thicker, larger, and had a heavy-set build. Future breeders wanted a more sporty dog and the breed evolved over time. By 1899, the very first Doberman club was created. Nine years later, the very first Doberman made its way to American soil. The breed was favored in both Europe and America and was used by police officials as guard dogs. Today, it is renowned as a family protector and will alert and protect its family if there is an intruder. This breed became so popular that it nestled its place as the second most popular dog breed in 1977.